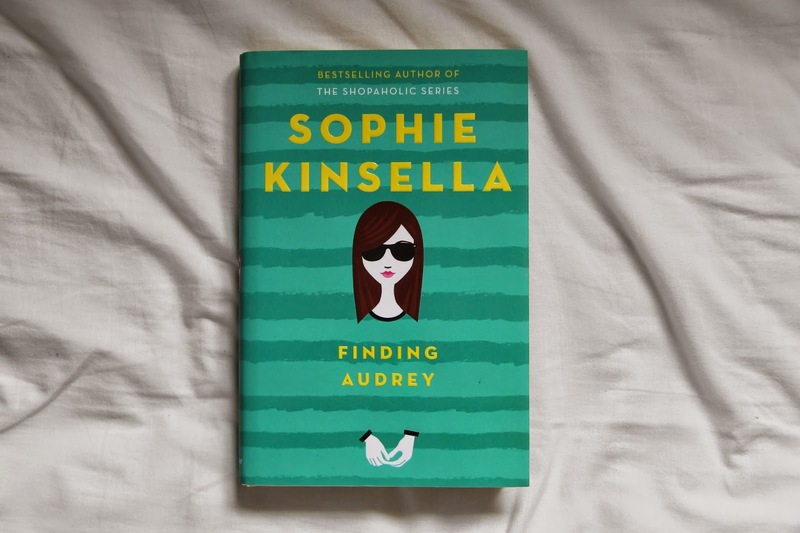 I was lucky enough to be sent the new Sophie Kinsella book "Finding Audrey"* from Penguin Random House and oh how I loved this book! I haven't been reading properly for a few months due to exams and after my last exam last Thursday, I came home to find this through my letter box, I took it upstairs and read it all right there and then with in 4 hours. I really enjoyed it. Our main protagonist will come as no surprise as it's Audrey; a 14 year old girl who, after a traumatic experience at school, started to suffer from social anxiety and depression and so was pulled out of school where she stayed at home in her dark bedroom watching television. Nothing seems to be improving until her brother's friend Linus comes in and helps her on her way to recovery. Sophie Kinsella did amazingly well with this being her first YA novel. She tackled the subject of anxiety in such away that was believable as well as not being over the top. What I've found with book that have centered around mental illness is that the authors makes the character's disorder their identity and that their life is nothing more than that that illness whereas Finding Audrey looks at life outside the mental illness and shows that just because you suffer from depression or anxiety doesn't mean you can't be happy at points or can't be funny which was shown through the funny lines that I did smirk and laugh at some parts which I can't remember the last book that really did make me laugh. It also shows that no one is defined by their past with their being very little reference to what happened that was one of the underlying causes of her anxiety and I think that it all carries such a great message. I liked how the whole book didn't just centre around the Audrey's illness but also looked at Audrey's family as a whole as well as exploring gaming addiction with her brother and how families carry on. It's a great one to relate to and realise that you're not the only family who sometimes seem like they're at the point of break down and that your mum isn't the only one who is always wanting to known what you're doing. Like any YA novel these days, there is a love story and I really like the one in Finding Audrey between Audrey and Linus. It's nothing too cliche but it's also nothing different but what I liked about it was how unforced it seemed and how natural the two characters were coming together. It wasn't too cheesy, it was just right. Romanticising mental illness, I feel, is a no no and there has been controversy over this happening in recent years. In my opinion, Finding Audrey did it right. They didn't romanticise mental illness but just had a love story where one of them is overcoming a mental illness. While, yes, Linus does help and encourage Audrey to do what she can to recover, Audrey is the one in control and she is the one, ultimately, trying to make herself better. An aspect of the book I really enjoyed was the film scripts as Dr.Sarah (Audrey's therapist) asks Audrey to record what happens in a day and this was such a unique and clever way of showing the journey and progress Audrey made through the book. I also liked some of the English-isms and the modern aspects with mentions of certain TV shows and Starbucks. It was such a quick read and, while I wish it was longer, I think it may have taken away from the experience as a whole. I really did enjoy this book and if you're looking for a simple and quick read that you will fly through, this is definitely one to check out when it's released on June 4th which you can preorder here in hardback with the beautiful cover it has!